Use A. A. Milne’s much-loved Winnie-the-Pooh stories as a starting point for classroom activities. On 24 August 1914, Harry Colebourn, a Canadian veterinary army officer, purchased an orphaned baby bear cub for twenty dollars. He named the bear Winnie, after his home town Winnipeg. 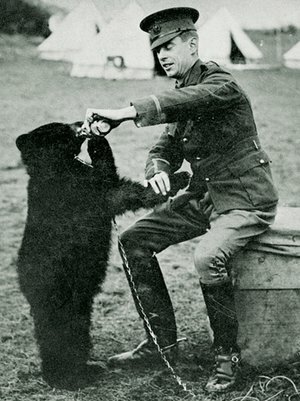 The bear travelled with Colebourn and the 2nd Canadian Infantry Brigade to England, where it lived happily as their mascot at their camp on Salisbury Plain until the Brigade were posted to France. Winnie was moved to London Zoo and became a permanent resident there when Colebourn returned to Canada at the end of the war. Just a few years later, a young boy named Christopher Robin and his father, the journalist and playwright Alan Alexander Milne, visited Winnie in the bear enclosure.